Ian joined Damory in August 1992 when the vets were mixed practitioners covering all species. It was soon realised that a much better service would be provided by concentrating our efforts to one of the three areas of practice; Small Animal, Equine and Farm. 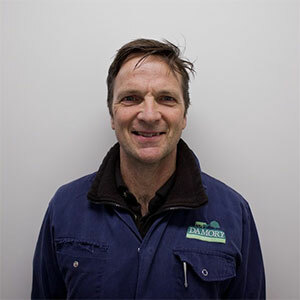 As Ian has always had an interest in the farm side of veterinary work, he moved into this area and has a special interest in bovine fertility, lameness and nutrition. His current new adventure is to become involved in embryo work and has started flushing a few cows with the idea of being able to implant them directly into recipients, with a longer term view of freezing and storing them for use on their respective farms of origin. In his spare time Ian enjoys long distance running and has completed 3 marathons to date, raising money for breast cancer care. He hopes to gain entry into the London Marathon soon before all his faculties are lost! He does enjoy other forms of sport, but more as a spectator then participating.